My family will be traveling to Disney World this week, so I thought this would be a good subject to tackle this week. The answer to this question is not a simple one. Sleep will likely get disrupted during travel, it almost always does with little ones. BUT there are things you can do to avoid undoing your child's good sleep habits completely. 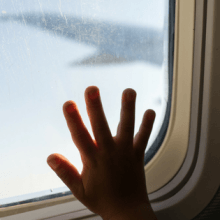 Schedule drive/flight times around your child's schedule. If your child is good at sleeping in the car, plan to drive when your child will be napping. Also, plan flights around when nap times should happen also. If worst comes to worst and nap doesn't happen, plan to arrive at a resting place before bedtime. Helping your child get settled and prepared for a good night of sleep can be the most beneficial for your little one's body. Bring a piece of home. To feel fully relaxed and ready to sleep, a lot of children do well with a little piece of home with them while they travel. I often suggest bringing your crib sheets form home, lovies, sound machines, pj's….anything small enough to pack that will help your child feel at ease in a new place. Use a dark sheet to drape over the window. I don't know about you, but you never know what you are going to get when you stay at a hotel or a family member's home. The sleeping conditions might be just perfect, or they might be less than ideal. Rather than leaving my families quality of sleep up to chance, I like to come prepared. I often bring a large dark bed sheet with me; that way, I am able to make a brightly lit room into a dimly lit, sleep-friendly room for my family and me. I can't tell you how many times this simple trick has saved us from sleepless nights during travel. Help your children mentally prepare. Telling your children about the trip and what they might expect can be hugely helpful. Being able to prepare their minds for a new experience can save your child a lot of surprises, and if they are calmer and less surprised, they may settle more easily for sleep times. Also, if you're able to arrive at your sleep space with enough time to adjust prior to bedtime, this may help the unknown be a little less daunting for your little one. Offer extra support. We all feel less settled when in new environments and situations. Offering your children emotional and physical support in a new location can help them settle more easily in the new environment. Using a gentle fading method can be a great option when introducing them to a new environment and situation. Shape expectations. If your child is verbal, and you decide you want to go ahead and bedshare during your trip, but its not something you want to do when you get back home, explaining to your child that bedsharing is fine while you're not at home. Making it clear that when you get back home you will be sleeping in your own cozy bed and mommy and daddy in theirs will help establish expectations before a new habit is formed. Following through with any commitments will be important. With all of this said, I want to invite you to join our family as we embark on a trip to Disney world!! I will be sharing sleep challenges we might face and how we try to navigate those challenges! We hope you will join us this week!